Hare Cottage is a 17th century character cottage with beamed ceilings, a log burner and exposed brickwork which has been sympathetically renovated. Downstairs has been opened up to create a lovely spacious kitchen/dining area with a sloped beamed ceiling which overlooks the back garden, as well as a spacious separate sitting room. An ideal place for up to four people, with two upstairs bedrooms and a bathroom and a good sized fully enclosed back garden. 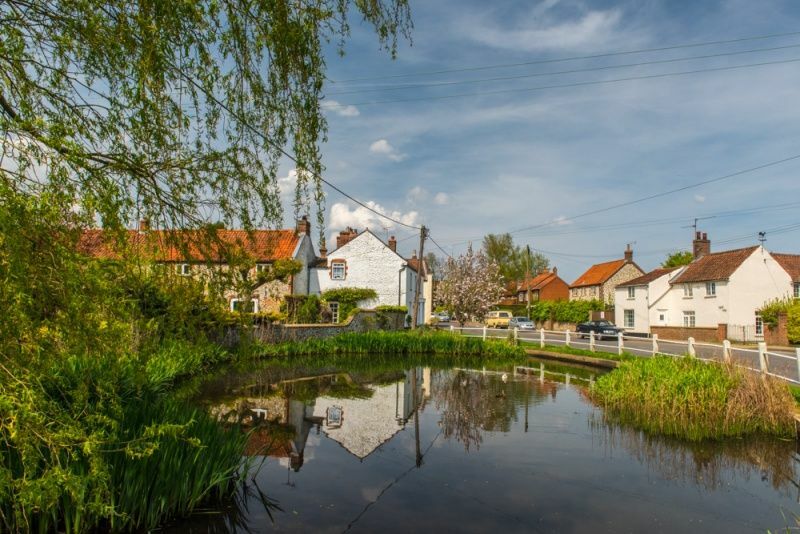 The cottage is conveniently situated within the heart of Docking village, within walking distance of a local pub, a well-stocked village shop, a fish & chip shop, children's playground and a fishing lake. The beautiful coast at Brancaster and Thornham is only 10 minutes away, with the charming Georgian village of Burnham Market approximately 7 miles drive. This part of the world is a doggie paradise and dogs are very welcome to stay in this lovely cottage. Entrance via a split stable door from the secure back garden into the lovely kitchen/dining area. There is the advantage of free wifi now provided in the cottage. Kitchen/Dining Area: lovely double length room with a sloped beamed ceiling and solid oak floor. There's a modern fitted kitchen at one end and an L-shaped built-in dining area conveniently situated at the other end, enjoying views overlooking the garden form a new large window. The kitchen is well-equipped with an integral dishwasher, under-the-counter fridge with icebox, washing machine, microwave and a Bosch electric oven with halogen hob and extractor hood. Sitting Room: A spacious room with an exposed brick fireplace housing a log burner, with a basket of logs provided for stays from November through to March (there is a children's fireguard if required). There are two sofas, a TV/DVD, well-stocked bookshelves and a good selection of DVDs and CDs for adults and children to enjoy. There is a door to the staircase. Stairs are not too steep and are straight. Under the stairs is a handy cupboard storing an iron, ironing board, fire-guard and clothes horse. Bedroom 1: Newly decorated with a king-size bed, bedside tables and lamps, wall-mounted TV, dressing table and chair, spacious built-in wardrobe with ample shelving and hanging space. Bedroom 2: Newly decorated twin room with single beds (with storage baskets under), bedside lamps and a chest of drawers. Bathroom: Bath with shower mixer taps and overhead fixed showerhead, hand basin, WC. There is off-street parking for 2 cars in the shared shingle drive at the side of the cottage. The south west facing back garden is fully enclosed and secure for small children and dogs. There is a sunken shingled area just outside the back door with a picnic bench seating four (additional garden chairs are in the understairs cupboard). There is also a good-sized lawn for guests to enjoy. There is a small clothes line at the end of the garden. Dogs are very welcome to stay at Hare Cottage and the owner kindly provides water bowls, feeding mat and a doggy welcome pack! 10 out of 10. Garden is large and very secure. Kitchen was well equipped and had everything we needed. It was everything we needed for a 2 week holiday with a local pub for food and drinks. Better than expected. Lovely cosy , very dog friendly cottage in convenient location. Would stay again. Lovely accommodation and well equipped. We had two dogs and the garden is large and is very secure. The kitchen was well equipped with everything you would need. Better and bigger than expected. We thoroughly enjoyed our stay at Hare Cottage, kitchen very well appointed and lots of personal touches and a welcoming gift. A lovely place to come back to after a day at the beach. Ideally situated for all the beaches but ideal for Old Hunstanton the best beach in our opinion. Having the shop across the road was extremely useful. All in all a delightful holiday. Cottage was as expected. The property was well equipped, it was very comfortable expecially the beds. The garden was perfect for our dogs as it is very secure. We both felt that the cottage was very well placed to enjoy the whole area. We never had far to drive to get to the places we enjoy along the coast. We were very lucky with the beautifull weather but feel the cottage would be very nice at any time of year. Would stay again. Beautiful interior, house lovely, warm and comfy, nice secure garden. All amenities you would want. Would stay again. The cottage was well placed and had everything you needed. A lovely place, would recommend to anyone. The owner and the agents were friendly and very helpful. “ Cottage better than expected. Good garden. Good location. Would stay again. Really enjoyed our time there"
Cottage met expectations. Very clean. Rear garden good for dogs. House-keeper Gillian lovely and helpful. Would stay again. Cottage was better than expected and very clean and well-equipped. Would stay again! A very welcoming and comfy cottage, very clean, secure garden great for my dog, a nice touch was the dog treats and welcome gift left for us. Would stay again. The cottage very clean, good garden, felt like home, perfectly placed, great size, loved it, would stay again. We have stayed in many cottages but Hare was definitely the best. It was warm and homely and very well equipped.